REVIEW: Sofrito Soundsystem is the London-based DJing team of Hugo Mendez, Frankie Francis and The Mighty Crime Minister. They specialize in unearthing rare Latin and African recordings, re-edited the often poor-quality vinyl and turning it into the raw material for smoking dance parties. This is their first full-length release, and it’s outstanding. Mendez’s specialty is French Caribbean music so we get great super-obscure tracks from Guadeloupe (4, 12) and French Guyana (10); the Colombian (1, 3, 7, 13) and West African (5, 6, 11, 15) tracks are equally good and very unlikely to be in the library of even the most hard-core collector. Except for 6, these aren’t beat-adding remixes at all – simply re-edits that clean up and EQ the originals for a better dancefloor experience. 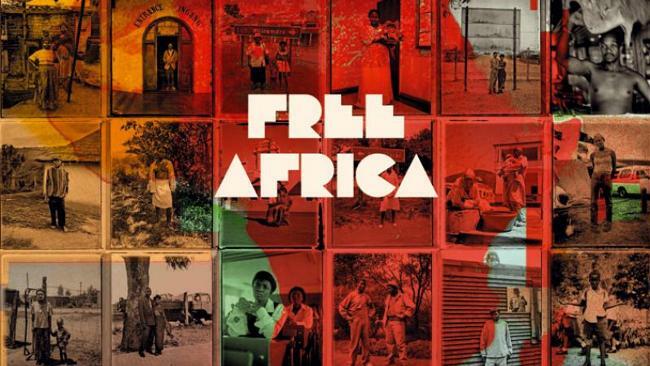 Simply a terrific compilation that belongs on your shelf next to the best of Soundway, Analog Africa and Strut – virtually every track here could be recommended for airplay. Orchestre Poly-Rythmo | "Pardon" & "Lion Is Burning"
REVIEW: Orchestre Poly-Rythmo De Cotonou is possibly the oldest of the classic post-independence West African bands still in existence. Formed in 1968, their 70's recordings are some of the most prized collectors’ items in African music; their catalog has been reissued by labels like Soundway, Analog Africa and Popular African Music. Fans of these reissues assumed the band broke up a long time ago. But they're still at it, with some younger members augmenting a few of the originals, and they made their first-ever European tour in 2009. Their first new recording in over 20 years, Cotonou Club, will be released in the USA in April; here’s a two-song single from the album. Both tracks are excellent – “Pardon” is a patented Poly-Rythmo midtempo organ-driven groover, “Lion Is Burning” is darker and more rock-influenced (reminiscent of Talking Heads’ Remain In Light), featuring contributions from members of Scottish rock band Franz Ferdinand. REVIEW: Jeremy Barnes, founder of the New Mexico-based duo A Hawk And A Hacksaw, is best known as the drummer in the indie rock band Neutral Milk Hotel. Here he plays accordion and his bandmate is violinist Heather Trost; they’ve been working as a duo since 2004 and they’re joined here by American and British musicians who share their interest in the music of eastern Europe. I’m generally pretty averse to indie-rockers who dabble in global exotica, but this band stopped dabbling a while ago – they’re fully immersed in Romany (gypsy) music, having spent two years living in Hungary and much time traveling and playing with musicians throughout the region. Until now, A Hawk And A Hacksaw’s efforts have left me cold, but with this album I think they’re really onto something. This is 21st century social music, raw and spontaneous and at the same time worldly and informed by cross-cultural points of view. Really worth a listen for fans of Balkan music and folk music in general who are ready for something a little bit different. REVIEW: Club d’Elf is the brainchild of Boston-based bass guitarist Mike Rivard. It’s an improvisation-driven project (a jam band, if you will) whose floating membership includes some of Boston’s finest jazz and rock musicians: organist John Medeski, violinist Mat Maneri, guitarists David Tronzo and David “Fuze” Fiuczynski. Rivard’s old friend Mark Sandman (Morphine) turned him on to Moroccan gnawa trance music years ago, and Rivard has been steering Club d’Elf more in that direction in recent years – this is his first album of nothing but Moroccan-based material, and he’s drafted some expert players for the effort, including Hassan Hakmoun and Brahim Fribgane. For my personal taste, there’s too much prog-rock noodling on some of these tracks, but the band really clicks into overdrive on two unlikely covers, Cream’s “Sunshine Of Your Love” (track 5) with Arabic vocals by Hakmoun and Morphine’s “Rope On Fire” (13). These two tracks are well worth the price of admission and are as compelling as anything I’ve year so far this year. More of this please, gentlemen. 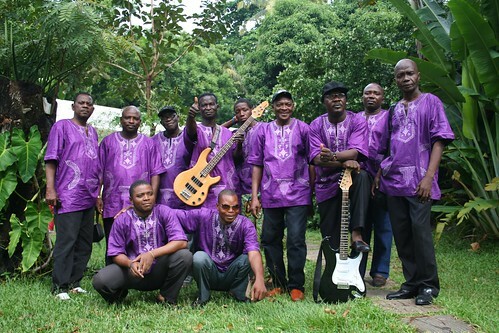 Orchestre Poly-Rythmo De Cotonou (pictured above) is possibly the oldest of the classic post-independence West African bands still in existence. Formed in 1968, their 70's recordings are some of the most prized collectors items in African music; their catalog has been reissued by labels like Soundway, Analog Africa and Popular African Music. Fans of these reissues assumed the band broke up a long time ago. But they're still at it, with some younger members augmenting a few of the originals, and they made their first-ever European tour in 2009. Their first new recording in over 20 years, Cotonou Club, will be released in the USA in April; you'll hear a track from it on this week's edition of Global A Go-Go. I'll also debut Balkan-influenced recordings by Canadian banjo player Jayme Stone and American indie-rockers A Hawk And A Hacksaw, plus play recent releases by The Bad Shepherds, The Sway Machinery and Los Chicharrons. And that still leaves plenty of time remaining for some classic 1970's tracks from all over Latin America. Ernesto Djedje (pictured above) is one of the greatest African singers of the 70's that you've (likely) never heard of. His adaptations of the local ziglibithy rhythm were huge hits in his native Cote D'Ivoire and throughout West Africa. Djedje died in mysterious circumstances in 1983, so he didn't live long enough to enjoy the first world-music boomlet which almost certainly would have brought him recognition in Europe and the USA. He's a fitting first subject for what I think will become an occasional feature of Global A Go-Go -- let's call it "Undersung Heroes of African Music." And now that Carnival is past and plenty of discounted hotel rooms are available, let's head down to Trinidad for a set of calypso, soca and steel band music. Plus something new from Cornershop of the UK, and another track from the superb new CD by Richmond's own Rattlemouth. REVIEW: The Sway Machinery is led by guitarist-vocalist Jeremiah Lockwood, who is interested in integrating Jewish cantorial music with contemporary sounds (Lockwood’s grandfather was a cantor). He’s also a skillful blues player, and his band features horn players Stuart Bogie and Jordan McLean from the Antibalas Afrobeat Orchestra. All these elements come into play on the band’s second recording, which was made in Mali while and after they attended the Festival In The Desert in Timbuktu. By all rights, this should be a god-awful hash of a project; actually, it’s quite brilliant. The rhythm section and horns absolutely cook, Lockwood’s evocative lyrics and singing (especially on tracks 2, 9 and 13) offer a somehow appropriate contrast, and guest Malian vocalist Khairy Arby (her Western debut, Timbuktu Tarab, was recommended here last year) totally steals the show on tracks 7 and 11. Like Balkan Beat Box (for whom Lockwood plays guitar), The Sway Machinery is forging a new, uniquely American-melting-pot musical genre. This one is most highly recommended to any listener with an active imagination. REVIEW: Now in their 22nd year, Rattlemouth is one of Richmond’s long-lived bands. They’ve thrived on their ability to evolve through the years – they started out as a kind of Euro-improv art-rock combo, they’ve written and performed music for dance and film, and their focus right now is on world music. This, their fifth full-length recording, captures the core of their current live shows – arrangements by guitarist George Lowe of classic compositions from Africa, the Middle East and Latin America. There’s no category for what this band is doing; it’s closer to jazz than rock for sure, so these are interpretations not covers, and each one sounds more like Rattlemouth than like the original recordings that inspired them. The band is fortunate to have two outstanding saxophone soloists in Danny Finney and Roger Carroll; they’re propelled by a rhythm section (Lowe plus bassist Marc Langelier and drummer Robbie Kinter) who are economical and sympathetic in a manner that comes only from years of playing together. If you’re at all interested in world music or jazz, give this one a listen – it’s absolutely world class. Samba Mapangala & Orchestra Virunga | "Maisha Ni Matamu" & "Zanzibar"
REVIEW: The well-traveled Samba Mapangala is a native of the Democratic Republic of the Congo, achieved his greatest success and fame in Kenya, and now lives in Maryland. He’s one of the best-loved East African singers, specializing in the mellifluous rumba Congolaise that will probably never go out of style in Congo, Kenya and Tanzania. His new album is scheduled for release this spring; these two songs are a teaser, and they promise another album of top-shelf music. Samba is supported here by a cracking small band featuring Zaiko Langa Langa’s Beniko Popolipo on solo guitar and Syran Mbenza of Kekele and the Four Stars on rhythm guitar; Kekele’s Wuta Mayi joins in on vocals. If you saw Samba at the Richmond Folk Festival in 2009, this is more of the same – world-class East African music from a guy who almost qualifies for WRIR’s local music shelf. In fact, the album was recorded in Arlington VA along with Paris and Nairobi. REVIEW: Los Chicharrons are Ramon Santana and Morten Varano, veteran electronic dance music DJs and producers. They’ve taken their interest in the sounds of Mali and linked it up with their house music-based production style -- the result is a killer CD that’s a whole lot more than just your standard remix set. They started with live sessions in Bamako and Paris featuring singers Mama Draba and Saramba Kouyate plus a host of fine musicians, then layered on keyboards and programming that give the songs the flavors of Afrobeat (tracks 2 and 7), Latin music (4), psych (7) and soul (8). Running through each track is the funky, soulful undercurrent of classic 1980’s house -- almost every track sits at about 120 bpm, and the female Malian singers are a new twist on the gospel-influenced vocalists of house music. This is intelligent dancefloor music of the highest order, light-years ahead of folks who use world music as exotic seasoning in their same-old mixes.